Chinese basketball stars Yao Ming and Yi Jianlian faced off Wednesday night in Washington, D.C., but it was rookie John Wall who stole the show with a triple-double as the Wizards (2-4) defeated the Houston Rockets 98-91. The 7-6 Yao, who helped make basketball the most popular sport in China, had to leave the game after six minutes because of a strained tendon in his left foot. 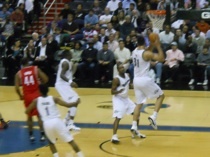 Meanwhile, his protégé, the 7-foot Yi, had his best game in a Wizards uniform, scoring 13 points, grabbing seven rebounds, and blocking four shots in front of 16,665 on Asian American night at Verizon Center in a game that more than 400,000 people in China were expected to watch early in the morning. Wall and Yi hooked up for one of the plays of the game in the third quarter, when Wall passed to Yi for one of his 13 assists. 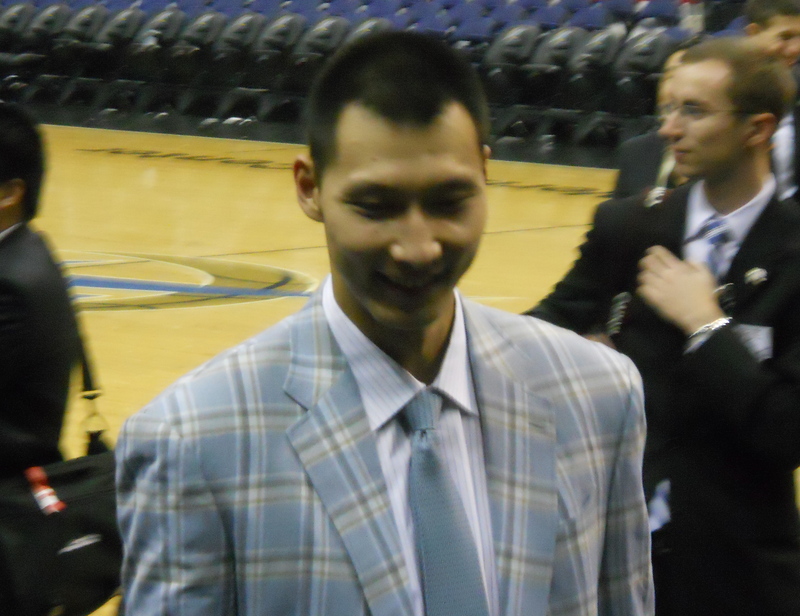 Yi drove past Luis Scola of the Rockets (1-6) on the baseline and threw down a dunk to give Washington a 68-63 lead late in the third quarter. Yi grabs one of his seven rebounds against Houston Wednesday. Photo by Mike Frandsen. Wall, the number one pick in the 2010 NBA draft, also had 19 points, 10 rebounds, six steals and only one turnover. Wall became the sixth player in the history of the NBA to have a triple-double in the first six games of his career. One of those players was Magic Johnson, who was in attendance, sitting to the left of the Wizards’ bench next to owner Ted Leonsis. Will LeBron James stay in Cleveland, or go to NY, NJ, Chicago, Miami, or…Washington? People are starting to talk a little about the possibility of LeBron James playing for the Wizards in addition to the usual suspects of Cleveland, New York, New Jersey, Chicago, and Miami. I personally think he’ll stay in Cleveland, and I almost want him to because I believe in loyalty. But as a lifelong Bullets/Wizards fan, it would be great to see LeBron play here in D.C.
With overall number one picks Alex Ovechkin, Stephen Strasburg, and John Wall, not to mention Donovan McNabb, do we even have enough room for LeBron? Of course we do. An astute observer said in one of the comments to my article on examiner.com that if LeBron signed with the Wizards, and Gilbert stays, they would be the most athletic team in the league, with Wall, Gilbert, LeBron, Blatche, and McGee. Here’s the article on examiner.com: Could LeBron James decide to play for the Washington Wizards? Could LeBron James decide to play for the Washington Wizards? Ten days ago, this reporter blogged that LeBron James should play for the Washington Wizards. Is it so crazy to think James could end up in Washington? New York, New Jersey, Miami and Chicago have been the teams most often mentioned, but so far not many people have talked about James coming to D.C., except a few wacky writers. For LeBron to come to Washington, the Wizards would most likely have to trade Gilbert Arenas. The Wizards are expected to attempt to trade Arenas anyway now that they have the chance to draft Kentucky point guard John Wall with the first overall pick. LeBron would like to play with Wall according to recent reports. Will LeBron James sign with the Wizards? Is it such a crazy idea? Ok, I don’t pretend to understand all the salary cap stuff, but is it so crazy to think LeBron James could end up in Washington? The main hurdle would seem to be for the Wizards to trade Gilbert Arenas and his huge salary. I’m sure they’ll try to do that anyway now that they have the chance to draft John Wall. LeBron would like to play with Wall according to recent buzz. He wants to be known as a global icon, and while Washington isn’t New York and doesn’t have the international ties of the Nets’ new owner, it is an international city. Also, with young players like Wall, JaVale McGee, Andray Blatche, and Nick Young, the Wizards are on the way up, though it’d be another year before they could compete for a title, even with LeBron. The Wizards already have more talent than the Nets and the Knicks. The Bulls clearly have the most talent of the teams that are being talked about. But I don’t think LeBron would want to follow in MJ’s footsteps. Also, could New York be too big for LeBron after growing up in Akron and playing in Cleveland? Would Washington be a nice compromise between Cleveland and New York? Personally, I think he will stay in Cleveland, sign a three-year deal, win a title, and then move on so he gets the best of both worlds. DC is definitely the place to be for sports stars, with Alex Ovechkin, John Wall, Steven Strasburg, and Donovan McNabb. Nobody thought Reggie White would ever end up in Green Bay. They had a lot of years between their glory days and their subsequent Super Bowls. It has been a long time since the Bullets were great, but they do have a great history – you just have to go back a ways. How about changing the team name back to the Washington Bullets and seeing James in a red, white, and blue uniform? Lady Luck visited the Washington Wizards Tuesday night. She was Irene Pollin, the widow of former Wizards owner Abe Pollin. After years of frustration in the NBA draft lottery, the Washington Wizards struck gold and won the top pick. Irene Pollin wore Abe Pollin’s 1978 Washington Bullets NBA championship ring for good luck to the lottery selection show in Secaucus, New Jersey. Click here to read the rest of my article on examiner.com.